So, its official: Britain has realised how much it has lost in not being in the space race and are thinking of putting a man on the moon. Hot on the heels of this monumental, or is that monumentally stupid, statement Lagoon Games is giving you your very own bottle rocket to own. I'm not sure that it will get you on the astronaut program, but it’s a hell of a lot of fun. The kit comes in a very nice fifties retro box, which whilst not crucial to the launch is a nice touch. 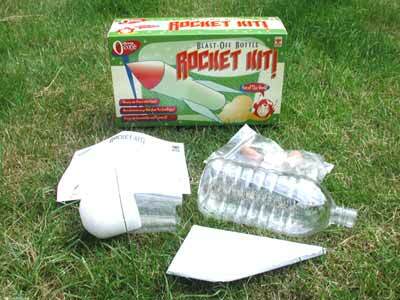 The rocket comes in a number of easily assembled parts. You get a clear plastic bottle (with an attachable nosecone), three hardy fins (with necessary attachments), a couple of corks and a bolt that makes up the engine. The kit is simplicity itself to put together and, presumably, you could paint it, though I would advise against this as the rocket gets its thrust from a chemical reaction between vinegar and baking soda - so you’re going to want to see what’s happening - and any added weight will effect how high your rocket will go. When finally assembled and ready for launch you add your vinegar and baking soda (not supplied) and wait for the pressure to build up from the chemical reaction. The mixture is a bit of a hit and miss affair, even though the quantities required are explained, but get it right and your rocket will go like a bat out of hell. The manufacturers believe that in favourable conditions the rocket could reach up to one hundred feet, though they only guarantee thirty feet. I have no idea how far up it went, but on its first flight I lost the thing as it shot over the house. However, even though it comes with no parachute, the emptied rocket is light enough to land even on a hard surface, in my case the road, which explains the disclaimer about the manufacturer not being responsible for any damage. Even if there is minor damage from the landing, construction is so simple that patching your rocket together again is never really a problem. Then all you need to do is fill it up with your vinegar/soda fuel and off you go again. 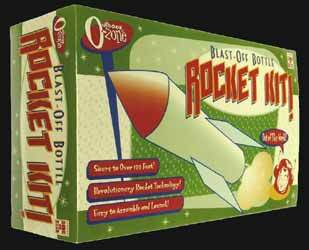 The recommended age is fourteen and upwards, but one of the things which I liked about the Blast-Off Bottle Rocket Kit is that it allows quite young children to get into rocketry, as there are no combustible fuels to deal with. In the end this was a hell of a lot of fun to play with. The fuel is safe, and cheap, to procure and the thing will continue to launch for as long as your ingredients last - though I would recommend that you don’t try to launch it from a small terraced garden, not unless you get on really well with your neighbours. The look on the face of the bloke when I asked for my rocket back was priceless.